'Before you settle in, it seems there is a problem. We seldom see a high official around these parts, you see, so we're not sure what to do with you. 'No problem, just let me in,' says the man. 'Well, I'd like to, but I have orders from higher up. What we'll do is have you spend one day in hell and one in heaven. 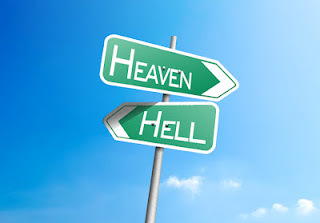 Then you can choose where to spend eternity. 'Really, I've made up my mind. I want to be in heaven,' says the senator. 'I'm sorry, but we have our rules. 'And with that, St.Peter escorts him to the elevator and he goes down, down, down to hell. Also present is the devil, who really is a very friendly & nice guy who has a good time dancing and telling jokes. 'Now it's time to visit heaven. 'So, 24 hours pass with the senator joining a group of contented souls moving from cloud to cloud, playing the harp and singing. They have a good time and, before he realizes it, the 24 hours have gone by and St. Peter returns. 'Well, then, you've spent a day in hell and another in heaven. 'Well, I would never have said it before, I mean heaven has been delightful, but I think I would be better off in hell. 'So St. Peter escorts him to the elevator and he goes down, down, down to hell. He sees all his friends, dressed in rags, picking up the trash and putting it in bags as more trash falls from above. 'I don't understand,' stammers the senator. 'Yesterday I was here and there was a golf course and clubhouse, and we ate lobster and caviar, drank champagne, and danced and had a great time. Now there's just a wasteland full of garbage and my friends look miserable. What happened?